Bold and distinctive, the Banbury Executive Desk blends elegant design details with top-of-the-line construction and striking materials. 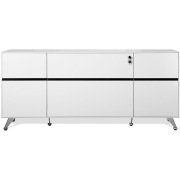 Chromed steel legs are accented by black trim, a large rounded top (71"w 35.5"d) and privacy panel. 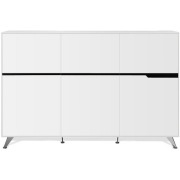 The attached cabinet offers a vented compartment perfect for housing your computer's CPU. A pencil drawer and filing drawer at the cabinet's end complete the piece. 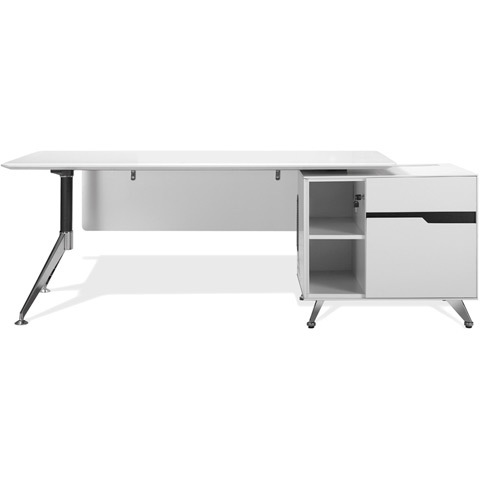 Cabinet measures 30"w 25.5"d. Commercial grade and perfect for the home or office, the Banbury Executive Desk is the perfect solution to your need for a functional, solid and beautiful workspace.